Inside: An open letter to the woman who will marry my son. It is February and I am feeling sentimental. My sons are young adults. Neither one of them is engaged, but I have been thinking of their future wives a lot lately. I am not sure if I have met her or not. Maybe I have and maybe I have not. Only time will tell who these wonderful women will be. I have been praying for both of them for years. Both of my sons have said they want to be a husband and a father someday. I have been preparing them to be good men, great husbands, and great fathers. I abhor the stereotype of an overbearing mother-in-law and will not become that woman. I have a couple of friends who have said that their mother-in-laws are among their favorite people. My prayer is that I am that type of mother-in-law. I give advice for a living and I have advice for you. When the time comes I will do my best to not offer it unless you ask, since this is an open letter I will be freer with my advice today than when I am talking to you face to face and I know who you are. Even though I am not sure who you are I know that you are intelligent and that God has a purpose for your life. I know this because I believe God has a purpose for all of us and I know the women my sons choose as life partners will be intelligent, it is one of the qualities they find most attractive in a woman. Develop a plan for your life beyond being a wife and mother. Being a wife and mother are two of the most important jobs in the world. You may choose to be a full-time wife and mother for a time or you may always have another job, that is a decision you will make and I will support your decision. Most of us only have children at home for 20 years or so and once they are teenagers they will be glad you have other things to think about besides them. They deserve to live their life and you deserve a life too. 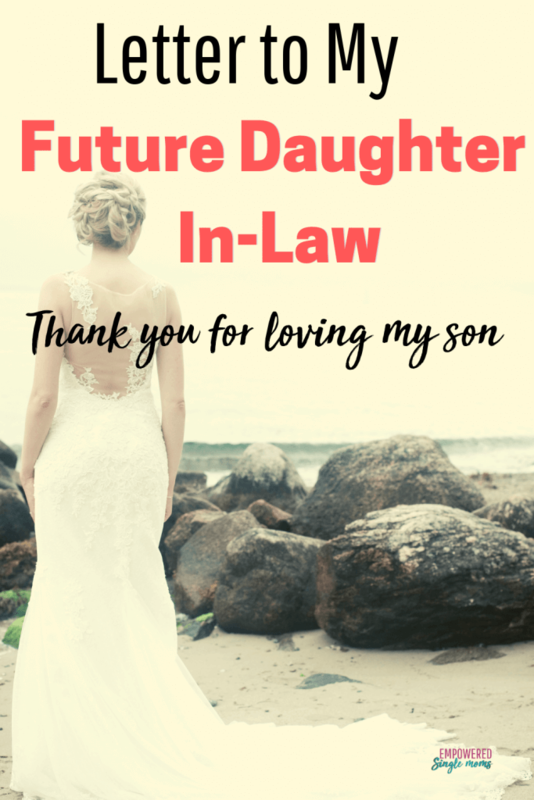 My sons are wonderful men, but marrying one of them is not enough of a plan for your life. They will both want confident, interesting, and intelligent women. Don’t waste your gifts struggle with the hard questions and make a career plan. You can have a career and be a wonderful mother. It isn’t always easy, but it is worth the effort. Besides we are living in uncertain time.s Tragedy happens people lose their jobs, people die untimely deaths or become disabled. There are so many other things that can happen. You are more secure as a family if you are able to share in providing for the family doing something that gives you meaning and purpose. You deserve respect. I have taught my sons to respect women, but it is also up to you. I have set the foundation, but you will help shape him too. We teach people how to treat us. He knows how to treat women with respect don’t let him get by with anything less. Don’t depend on him to make you happy. We are all in charge of our own happiness. Don’t expect more from him than he can give you. You need your girlfriends too don’t abandon them for him. The best man in the world makes a great friend, but a terrible girlfriend. Sometimes you just need to be with other women. He was my boy. I love him with a love I never understood until I became a mother. He is your man and my prayer is that the two of you will do better than I did on the til death do us part promise. I will do all that I can to support you in that. I know that I am not the most important woman in his life anymore and I delight in that. I have raised him to put his wife before his mother. I have done this because when he is ready to get married I want him to have a strong marriage and a happy family. I will support that in whatever way I can because my prayer for him is that his wife will be with him long after I am gone and I will love her for that and so much more. We want the same thing. We both want you and my son to have a strong and happy marriage. We both want the two of you to be great friends and to have each other’s backs. When you are good to my son and he is happy I love you for that. You are not in charge of his happiness, but it is much harder to be happy in a marriage where people do not treat each other well. I want you to become a part of my family too, not just create your own family. I will respect that your family is your family. I have prayed that God prepares you and my son for each other. I will continue to pray for you regularly because you are the most important person in my son’s life because the 2 of you are a team. Marriage is not a 50-50 arrangement it is a 100%-100% arrangement. It will work best if you both strive to give 100% all of the time. We all have days when we fall short of our ideal. If you both are only giving 50% most days you will not meet in the middle. Men and women often think differently and view the world differently. When you are married you will bump up against each other and hurt each other without intending to hurt the other. Give each other grace. Say I love you with words and actions generously. Be generous with your apologies. It makes you a bigger, stronger person to admit when you are wrong or have hurt your partner. This seems an easy thing to promise on your wedding day. I have been a couple’s therapist for decades. Honesty and faithfulness are sometimes hard to do. Dishonesty and unfaithfulness always lead to pain and heartbreak no matter the outcome. Guard your heart, mind, and behavior with fierceness. Many days this will be easy and natural, it is the days it is not that you must be especially on guard. When temptation strikes, resist and turn to each other to solve the problems you are having. I have so much to say, but this is enough for now. I hope we have many years to get to know each other. I am so excited to meet you and know who you are.